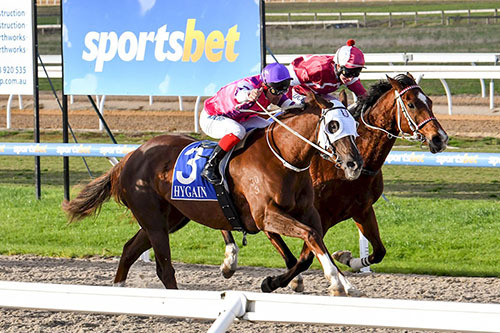 Exflytations had no doubt her best career win to date with a very brave and tough effort at Pakenham Thursday 31st May when coming off speed to score in a most impressive performance. The outside draw was always going to be an issue, made even more difficult with a slow start, actually jumping last and jockey Michael Walker had to use her up a bit early in order to gain a position mid field. From that point Michael never panicked and was able to get Exflytations to travel well off a strong tempo and started urging the Daughter of Exceed An Excel on from about the 600 meter mark to make ground which she did and came with a nicely timed run in the straight (after being used up at both ends) to score bravely, by nearly half a length from Elegantly Wasted with Swiss Moments filling third. 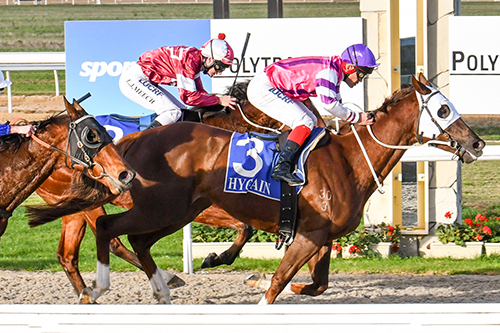 Pakenham’s win by Exflytations when given no favours, was her 3rd victory from 15 career runs to date and with 1 second and 4 thirds has now banked just over $67,000 for connections. Whilst there are no grand plans for Exflytations, who does look to have come back a much stronger mare this time around after her latest spell, placed correctly she will be expected to remain a consistent galloper who is particularly well suited to dry ground.